Pain outside of the knee tends to be easier to diagnose due to less tissue having influence on the lateral side of the knee. 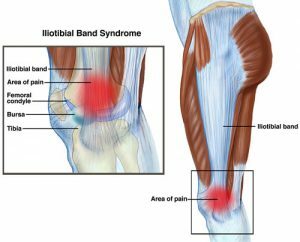 However, one of the more important structures that can cause pain outside of the knee is the iliotibial band (ITB). 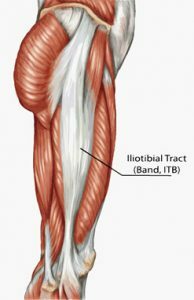 The ITB is a large piece of fascia that runs from the outside of the hip (tensor fascia lata) and runs down the leg to insert into the outside of the knee (tibia and patella). At the knee, the ITB is responsible for providing lateral support acting like another large ligament which tightens in knee flexion and lengthens in knee extension. ITB friction syndrome is a common injury that causes pain outside of the knee, it is brought on by poor biomechanics and muscle weakness. It is thought that internal rotation of the tibia alters the position of the ITB, which then increases the compressive forces at the knee and inflaming the fat pad that is located underneath the attachment at the knee. The increased internal rotation of the tibia is a result of poor hip control and foot positioning, so ITB friction syndrome is a caused by the joints above and below, instead of the knee itself. Runners with ITB friction syndrome tend to have a weakness in their hip abductors (glutes), knee flexors (quads), and knee extensors (hamstrings). These weakness combined with fatigue usually results in increased compressive forces around the lateral side of the knee, which leads to ITB friction syndrome and pain outside the knee. This is why it may seem that runners suffer from ITB friction syndrome more than the sedentary population. So, symptoms of ITB friction syndrome typically include an ache over the outside of the knee, which is aggravated by running or cycling, and the pain develops as you continue with the activity. Specifically, downhill running seems to be one of the most aggravating factors of ITB friction syndrome. The outside of the knee will be tender to touch and often presents with local swelling. Due to the nature of ITB friction syndrome, it is essential to address not only the knee itself, but the hip and foot because of their influence on the ITB at the knee. Treatment at the knee itself will be aimed at reducing inflammation. Therefore, ice should be applied on and off for the first 3-5 days and electrotherapy can also be used to help with local pain. Corticosteroid injections can be used by a medical professional if symptoms are severe and all other treatment options fail to work. Massage or self massage with a foam roller can also be used on the ITB and the tensor fascia lata to reduce tension and tone in ITB. Tightness of the tensor fascia lata and glutes are commonly associated with ITB friction syndrome, so it would make sense that stretching these is another treatment option. Strengthening of the glutes is probably the most important part of the treatment to correct the underlying weakness of these muscles. Additionally, correcting walking/running gait, specifically foot mechanics, will be largely influential throughout the rehabilitation to reduce the lateral stress placed upon the knee and pain outside of the knee. In severe cases, when none of the already mentioned treatment options relieve the pain at the knee, surgery can be used to release the ITB and is usually very successful. However, surgery will only be done if all other forms of treatment fail to work. Anyways, I hope you enjoyed reading and found this post helpful. If you’d like any further information then please get in touch.